Ryan Braun is a phenomenal liar if I do say so myself. I personally think he would make a fantastic double agent for the FBI or CIA. That speech right there is unbelievable. I don’t know about you, but I think he took it too far when he said he’d bet his life that these substances never entered his body. Or was it when he mentioned all the honor, integrity, and class he has? (HA!). While it is great to see such a dishonest and deceitful player get caught, it is simply not enough to change the culture of a seriously tainted sport. Now as a lifelong baseball fan, I applaud baseball for what they are trying to do. Major League Baseball (along with every major sport everywhere) has a serious drug problem, and it needs a cure. The fight against performing enhancing drugs is long overdue. The only problem is the problem is so deeply rooted, and the players have such a union set up that it will never allow such a profitable problem to be solved in its entirety. These guys make their fancy livings with the help of this stuff. And as long as the guy next to you is doing it than I guess you’ll be doing it too. Join me as we travel back to reality. With the system we have in place in Major League Baseball and the knowledge that the union will never allow stiffer consequences for these actions, this problem will continue to persist. And that is exactly why this suspension means absolutely nothing. As of today, Ryan Braun is getting an 8 month vacation. Yes, it is unpaid but as I stated earlier that means nothing to him. He’ll go home and enjoy time with his family, and enjoy time away from a horrible baseball team. Sure his name will always be slightly tainted, but after watching that video from 2 years ago, I think he’ll be just fine. As far as the 65 game suspension goes, some of you might be wondering how they came to such a number? Major League Baseball’s Joint Drug Agreement states that if caught with banned substances you will incur penalties of first a 50-game suspension, second a 100-game suspension, and finally if caught a third time a lifetime ban from baseball. So what clearly happened with Braun was MLB came to Braun and his lawyers and said this is the evidence we have on you. 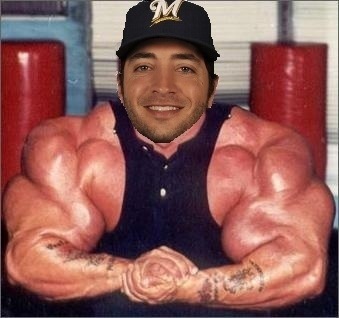 The evidence must have been overwhelmingly in favor of MLB, because Braun folded like a cheap suit and basically asked for the handcuffs and said I’ll put them on myself. MLB obviously wanted the 100-game suspension if not more, but were not planning to accept the minimal 50-games. So with Braun standing there with his pants down, he must have plea bargained his way down to the rest of the season. That is how they landed on the unorthodox number of 65. Did anyone else have a reversal of fortune after reading that horror story? Let’s take a quick look into that statement. ‘As I have acknowledged in the past, I am not perfect.’ Really? When was that acknowledgement again? I don’t remember ever hearing about that. ‘This situation has taken a toll on me and my entire family.’ No, not on you, just on everyone else involved except for you because you are the only reason this ordeal is taking place. I would continue translating and analyzing this thing of beauty, but I don’t want to be sick to my stomach all day. The bottom line is that this suspension is the first of many, and it is certainly a step in the right direction. The only problem is it is the equivalent of taking about 5 steps up Mount Everest. Finally, you all must be wondering what this means for Alex Rodriguez. It means nothing good for A-Rod that’s what it means. Sources are already saying that A-Rod is in discussions with MLB to work out a deal. Hmmm, that doesn’t sound like good news now does it? He was supposed to be back in the Yankees lineup Monday night, but that was postponed due to a “slight quad strain”. Yeah, okay, and my grandma is a professional basketball player. The Yankees, or MLB, or someone obviously didn’t want Rodriguez to step on to the field this season. So they had a little talk with Alex and extended his stay on the disabled list. My prediction is that MLB drops the hammer on A-Rod before the weekend is done. What do you think of Braun’s suspension? Do you think it is meaningful or insignificant? What do you think will become of Alex Rodriguez? Please let me know by leaving your comments and responses in the comment section below. Thank you!